The barbell doesn’t care about you. It’s just a piece of iron. The big, bad brother to the kettlebell and dumbbell. You can load the bar to your absolute limit, which is one of the things that makes it like nothing else. You can do things with it that you can’t do with other strength, performance or muscle building tools. Arguably, it’s the single greatest tool to improve your overall strength and health. It’s sheer power is beyond belief, yet many choose to leave it alone and do nothing with it. It goes unused, misused, or disrespected. What a shame as the true fountain of youth lies in the grips of your hands. Gadgets, gimmicks, and fads come and go. The mighty barbell weathers the test of time. It has produced some of the strongest, fittest, and most athletic human bodies the world has ever seen. Yet, many choose to leave it be. Could it be the stigma? As with most things that produce legitimate results, it requires hard work. It requires proper use and technique to deliver the promise of strength, power, and resiliency. It requires energy, discipline, patience, and fortitude. The barbell is always ready for battles, but you must be ready for it. Battles that can be won by moving the bar with explosive speed or slow precision against gravity. Amazing battles, personal conquests, and exhilarating victories are to be yours, if you so choose. The slow grinds and fast lifts can do more for the body than just about anything else. This isn’t speculation, but plain truth. Overwhelming strength, unrivaled benefits, pure athleticism, yet extremely humbling – that is the barbell. 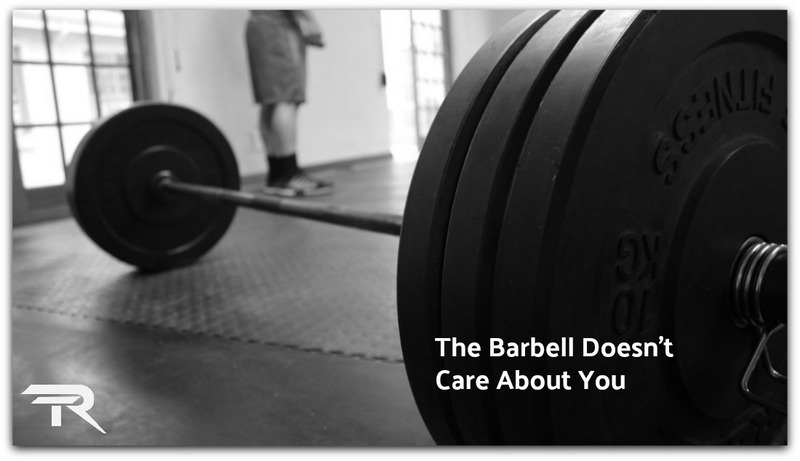 While the barbell doesn’t care about you, you should care about it because it can give you so much. Do what the vast majority do not. Learn how to use it so that your body can move closer towards fulfilling it’s potential. The barbell is there for you. It’s just a piece of iron or is it more? This post was inspired by an Instagram post I saw. It reminded me that I had written this short post some time back about the power of the barbell and had never posted it, until now. This didn’t deserve to go “un-published” – so here it is. If you can think of someone who needs to read this, then please share it on Facebook, Twitter or wherever you’d like. It may truly impact a person’s life. Scott Iardella, MPT, CSCS is a strength coach, athlete, and former “physio” who’s mission is to help men and women of all levels discover and amplify their strength and live a better life. Scott is the author of the book, The Edge of Strength.